Day 1: There was a day. The story of Job is not that different from your story or mine. Job was a man just living his life. He had work and financial responsibilities. He had friends and family. He was a devoted father who prayed over his children each day. Job loved the Lord and life was good. It was good, that is, until it wasn’t. The poor guy just never saw it coming. I know you can relate. You are doing carpool and paying bills. You go to work and the grocery store. You’re taking care of little children or elderly parents. You have cookouts with your friends and birthday parties with your family. Then, there is a day. Without warning, there is a day and nothing is ever the same. You find yourself face to face with suffering and you never saw it coming. Chances are, at this moment, you are hurting or you know someone who is hurting. Everyone is experiencing pain to some extent. We live in a world that is not our home. We are, as Peter reminds us, exiles in a foreign land. This place is broken and, sometimes, it wounds. We hurt. We bleed. We long for home. 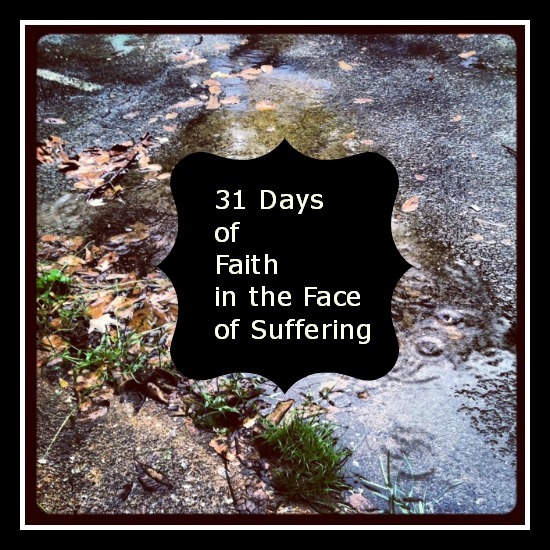 What do we do, however, when we are faced with something more than mere disappointment? What about those times when it takes all we have just to get out of bed in the morning? Suffering always seems to catch us by surprise. No one ever says, when tragedy strikes, “Ah, I was expecting you.” Why is that? Part of the reason is that, as adults, we spend a lot of time explaining away evil. We tell our children that monsters do not exist. We check in the closet and under the bed and give the “all clear” sign. I think Satan likes it that way. He would love nothing more than for people to think he does not even exist. After all, who is going to spend time and energy guarding against something that isn’t real? There is just one problem. Satan is very real and he is on the prowl. He is not a little red figure with a pitch fork trying to convince you to have a second piece of cheesecake. Treating him like a cartoon character is a dangerous thing to do. Because, while we are living like he doesn’t exist, he is seeking to devour each of us. The first step of faith in the face of suffering is to be aware that we have an enemy who walks among us. He seeks to bring doubt and discouragement. He speaks lies and distorts truth. I don’t think about Satan much. I think I’m afraid that if I do I’ll fall into his trap or something. But the story of Job reminds us that Satan is very real & active. I am always a little surprised how God allows Satan to be in his presence & then lets Satan test Job. And after all that Satan tries to do to make Job turn away from God, Job still praises God & doesn’t blame God for any of it. Thanks for the reminder that Satan is real & active. Thank you for this series right as I am going through a trial of cancer in my family. Couldn’t be a better time to read and study with you. Thank you! Thank you! Thank you!